One of the most talked about topics when the new year is approaching is creating financial resolutions you vow to keep for the whole year. Most people start with a promise to be a better version of themselves. It can be going to the gym, eating healthier food, going on a diet, or even picking up a new sport. This is partly the reason why most gyms are packed at the start of the year. However, these gyms also see people thinning out as the year progresses. This is because most people are not able to sustain their resolutions and fall back to their comfort zone. They start eating comfort food, sitting on the couch all day binge-watching their favorite movies. The same can be said with any financial plans they have. There are people who put together financial resolutions at the start of the year to help them get ahead and reach their goals faster. Just like how Fox News shared that a lot of consumers aimed to save more money each month in 2018. However, this is easier said than done. Many times, people lose track of their goals or get sidetracked and lose focus. However, this does not mean that you should abandon the idea of trying to be better with your finances. There are a few things you can aim to achieve which will be a big help as you try to put together a doable list. One thing you need to understand is that you have to create a sensible list and not an impossible task. You may not worth as much as Jeff Bezos at the end of the year but you can put together a concrete list of financial resolutions to help you improve your money management. Here are some of them. This one might not have anything to do with financial resolutions and more with a bandwagon mentality of dieting and exercising at the start of the year. There are a lot of people who plan to lose weight or even start eating healthier every January. This is usually at the top of a resolution they vow to keep for the whole year. However, including your desire to be a better version of yourself physically for the coming year also has some financial benefits. As you get healthier, the more efficient you become in managing your personal finance for the year. You can make better decisions and you might even have more energy in dealing with the stress your debt payments bring you. One more thing it can give you is the ability to look for extra sources of income. Having a healthier body could help you take on a second job. You might even be able to take up online jobs when you get home. You need extra energy to get those tasks done after a full day of work in the office so having a healthy mind and body will come a long way. Part of your financial resolutions needs to address your debt payments. It is important to have a plan of attack when it comes to paying down your financial obligations. At the very least, you should not miss any payment due dates. This will only make matters worse because fees and penalties will add to your total payments in the coming months. Debt payments can include aggressively tackling accounts with the highest interest rate to help you save interest payments down the line. You can also opt for quick mental wins to help you keep going by paying down accounts with the smallest balance. Either of these two can give you the blueprint to help you tackle your debt payments better. You can also look at debt consolidation to help you manage your payments better. This way, you only have to deal with one debt account every month. You only need to make sure that you make a payment on one due date and you will be sending out only one amount. This is a lot better than trying to juggle multiple payments month after month. One of the ways you can increase your income when you start to put together financial resolutions is to use your hobby. There must be something that you love to do in your spare time. What is it that you are good at which you can do day in and out? Think of that activity that you love to do and find ways to earn off it. Are you a budding photographer who loves to go out and take photographs? Why not consider using that hobby and look for income opportunities? Maybe some of your friends have parties you can shoot for and get paid in the process? If you love to bake, maybe you can sell them online? You can also identify some establishments in your area you can deliver to and split the profits with them. There are a number of ways to earn from your hobbies and the good thing is that you are doing something you love to do. One thing you can look forward to it is that the more time you spend on your hobby, the better you get at it. Once you improve, you might be able to charge higher as you become more skillful in your field. One of the best financial resolutions you can ever make at the start of the year is to try and improve your financial knowledge. For one, you need to accept that there are things you might not be well versed in. It can be investments in stocks, how your 401(k) works, or even the dynamics of your emergency fund. There are a number of ways to help you improve your financial knowledge like reading books or even taking up financial classes. You can also look up finance experts online and see what their take is on topics you are having a hard time with. Your parents and friends can even help you in this aspect. Close family and friends may have different financial experiences you can learn from. Once you set out and improve your finances, there are a few mistakes you need to keep an eye out on to help you stay on track. Here are some of the mistakes you need to avoid. As mentioned earlier, it might be far-fetched to try and be as rich as the Amazon.com founder or even be a millionaire at the end of the year. You might have heard some inspirational speaker mention something how it is better to aim high and miss than aim low and hit. However, you need to have a sensible goal and find that middle ground. Putting together financial resolutions should at least be attainable and not an impossible goal. This is one of the things that can really make a difference when you are trying to stay on track with a goal. Forbes shares that an accountability partner will help keep you on your toes as they check up on you from time to time. They are the ones whom you will share your list with on what you plan to achieve for the coming year. Technology has made leaps and bounds in helping people manage their finances. From online banking to automatic fund transfers and even online bills payment system. There are even apps that can help you track your spending or even budget your money better. Some can even look for coupons you can use when buying things you need. 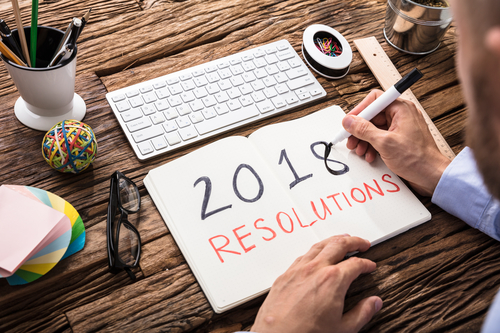 Putting together financial resolutions at the start of the year can be a big help in managing your finances better.